What's that logo? Click here. 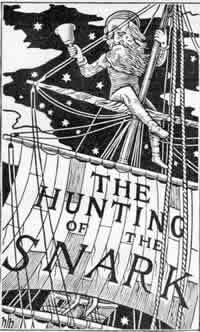 In his epic poem, "The Hunting of the Snark", Lewis Carroll (of Alice in Wonderland fame) describes an eclectic band of travelers in search of the elusive Snark. 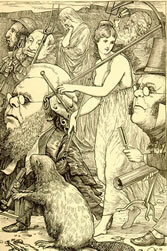 The Boojum, a spectral, mystical Snark alter-ego figures prominently in the poem, but is only vaguely described or illustrated. The poem cautions how one may "softly and suddenly vanish away" on encountering a Boojum. While some may consider that admonition a dire warning, we prefer to think of it as a metaphor for a transformational experience, an epiphany, a broadening of one's world view... all benefits of adventurous travel. Half a century later, an English botanist and aficionado of Carroll saw the strange Idria Columnaris tree, unique to Baja California and dubbed it a "Boojum". When we began our adventure careers over 20 years ago many of our trips took place in Baja California and we adopted the intriguing name, for better or for worse. A Boojum is also a subatomic particle from the more rarified realms of quantum physics and a Google search will reveal it to be the name of choice for cats, dogs, the occasional sailboat, a restaurant, a musical play, a search engine in the service of Jesus and some sort of a Celtic/Wiccan sword dancing troop in England "whose only reason for doing this is "... in order to party"." The spirit of the Boojum is indefatigable. The name has grown on us. It's from a poem about an eclectic group of travelers, it's distinctive and it has just the right touch of whimsy which keeps with our conviction that a sense of humor is the key element in a safe and fulfilling travel experience. But, don't forget your passport. The image we use as our logo is a tattoo found on the leg of a Scythian warrior who died over 2,500 years ago. Hundreds of years before the birth of Christ, this tattoed warrior's people had long since tamed the horse and created a nomadic culture based on freedom, mobility and respect for nature. His body and his many tattos were preserved by the frozen ground of the altai Mountains which border modern day Mongolia and Siberia. He had died in combat, his skull pierced by a battle ax. He was burried wearing a full length marmot skin coat and alongside him in the grave, laid out with his weapons and possessions, were two stallions wearing bridles decorated with gold. Thecreature depicted is most likely a snow leopard, the distinctive ringed tail and the feline body make that our best guess. While snow leopards are now extremely rare, due to hunting and the reduction of their habitat, they surely were important to the early nomads of Central Asia; a predator and traveler of similar cunning and skill. The Scythians are a people lost in the dusk of time, forerunners to the "modern" Mongol empire constructed by Genghis Khan. The Scyths left little in the way of written records and their tombs are our best window on their culture. They were, without dispute, masters of the steppe moving with their "fields on the hoof", hunting, gathering and along the way, finding time to create spectacular artwork indeliably etched on their own bodies.